UGC NET Result 2019 – The result of UGC NET 2019 is declared by National Testing Agency at ntanet.nic.in by July 15, 2019. Candidates can check UGC NET Result by entering application number or roll number and date of birth. It indicates marks obtained in Paper 1 and Paper 2, percentage, percentile. Top 6% candidates who obtain cut off marks are declared qualified either for Assistant Professor only or JRF and Assistant Professor. 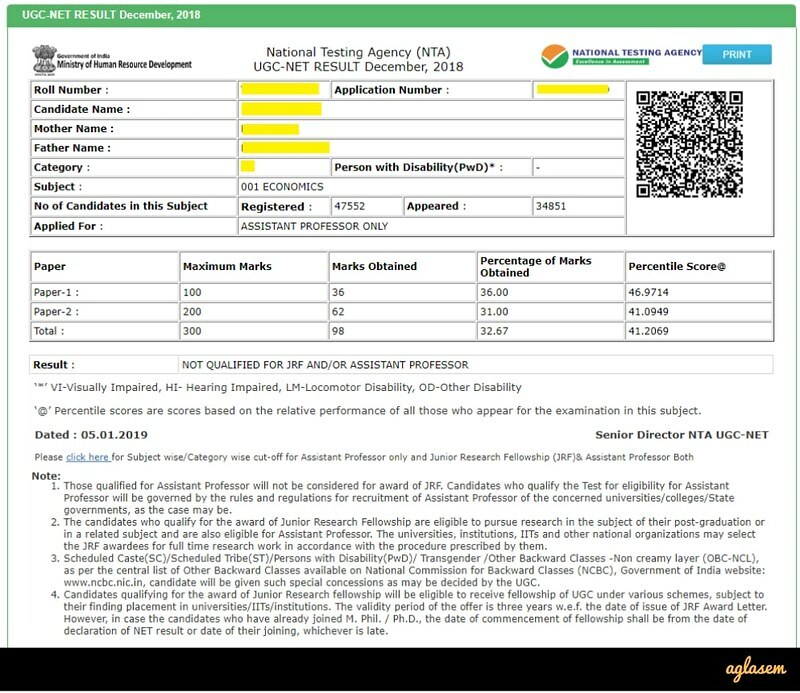 Get here complete details of UGC NET Result 2019 such as date, how to download, cut off and other information. National Testing Agency (NTA) is responsible for conduct of University Grants Commission (UGC) National Eligibility Test (NET), issuance of answer key, and declaration of its result. UGC NET 2019 Result declaration is as per following timeline. Around 9.5 lakh candidates registered for UGC NET June 2019. Last time 4.5% candidates qualified for eligibility for Assistant Professor, 0.4% qualified for JRF & eligible for Assistant Professor. Check here: Candidates can check UGC NET Result 2019 as per schedule from ntanet.nic.in. The total number of candidates to qualify are equal to 6% of number of candidates appeared for both Paper 1 and Paper 2. UGC NET June 2019 Cut Off will be published along with result. In the meantime, you can check last time’s cut off here. As per the information bulletin of UGC NET June 2019 exam by NTA, result will be announced by 15 July 2019. However we would like to inform you that NTA conducted UGC NET for the first time in December 2018. In that exam, the result announcement date was supposed to be 10 January. But NTA announced result on 5 January. Therefore it is expected that this time also NTA will announce UGC NET Result 2019 early. Most probably result will be out around 10 July 2019. Prior to that, UGC NET Question Paper, Answer Key, Responses are published. We are continuously checking official sources. If there is any news on this, we will update you here. The second UGC NET examination is conducted by NTA from 20th June 2019 to 28th June 2019 in two shifts per day across 235 cities in the country. The examination is conducted in 85 subjects. A total of around 9.5 lakh candidates registered for this exam. There are around 600 exam centres, 700 observers, 300 city coordinators, 20 state coordinators (figures as per last exam data). Personnel are deployed to ensure smooth conduct of exam. NTA will publish UGC NET 2019 Result numbers along with result. In the meantime, you can check last time details. This time the change was that there was no break between Paper 1 and Paper 2. Exam was along the lines of revised UGC NET Syllabus. NTA makes UGC NET exam system fair and transparent by releasing question paper, answer key, recorded responses. CCTV surveillance done at centers. Qualified candidates get certificates by UGC. 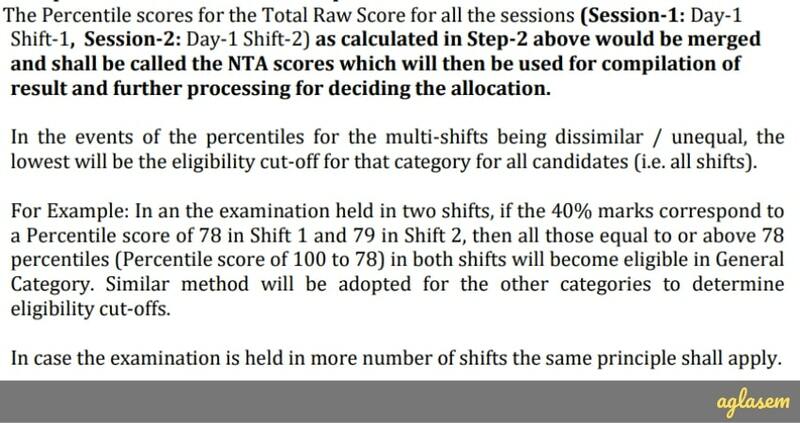 NTA scores the papers of candidates on basis of final official answer key of UGC NET. As per exam pattern and marking scheme of UGC NET, candidates get 2 marks for correct answers. There is no negative marking and thus no marks are deducted for wrong answer. Thus, raw marks in paper 1, paper 2 = Number of correct answers * 2. The exam is held over multiple days in multiple shifts. Therefore, NTA UGC NET Result contains percentile NTA score. Click here or go through the official document given below to understand the normalization process by NTA. Let us understand the process to arrive at UGC NET Result. The number of qualified candidates (all inclusive) equals 6% candidates appeared in both papers of NET. Different categories will get slots as per reservation policy of Government. If you have to find what is the number N of candidates of a category C (any category as per reservation) in subject S who will qualify for Eligibility for Assistant Professor in the subject S, then we will use this formula. Aggregate percentage of two papers corresponding to N, shall determine UGC NET cut off for Eligibility for Assistant Professor in subject S for category C. By the same token, it is done for all categories, and all subjects. NTA considers all candidates who had applied for Eligibility for JRF & Eligibility for Assistant Professor both out of total number of qualified candidates derived in Step 4 as consideration zone for JRF. If you have to find what is the number NJ of candidates of a category C (any category as per reservation) in subject S who will qualify for JRF and Eligibility for Assistant Professor in the subject S, then we will use this formula. Aggregate percentage of two papers corresponding to NJ, shall determine UGC NET cut off for JRF and Eligibility for Assistant Professor in subject S for category C. Likewise, it is done for all categories, and all subjects. How to check UGC NET Result June 2019? You can check the result of UGC NET June 2019 in online mode. The step by step guide to checking result at official website is described below. The official website of UGC NET June 2019 is ntanet.nic.in. So first of all go there. On official website, click on result link. Please note that result link is available only from date of declaration of UGC NET Result June 2019. You need to log in now. In first field, enter application number or roll number (same as in UGC NET Admit Card). And in second field, enter date of birth. Now login. Now your result of UGC NET June 2019 exam is in front of you. Check your score and qualifying status. NTA is responsible for events upto declaration of UGC NET Result. Issuance of e-certificate is upto the UGC NET bureau. Candidates who qualify UGC NET June 2019 can contact below given details to get the certificate. Head, UGC NET Bureau, University of Delhi, South Campus, Benito Juarez Marg , New Delhi, Pin Code-110021, Phone No. (011-24116316, 24115416, 24115419). UGC uploads NET e-certificate time to time online at https://www.ugcnetonline.in/candidate_login.php. If you have qualified as per UGC NET Result , then heartiest congratulations! However, if you have not, do not lose heart. You can fill the form of UGC NET 2019 as it happens next time. Thank you for visiting this page on UGC NET Result. If you have any queries on UGC NET Result 2019 June, please ask in comments below. If this article on UGC NET 2019 Result was helpful for you, please like and share it with your friends.